Is it true that following a certain diet can reduce belly fat? And is there a special food that you can add to your diet to help slim down your midsection? Are some diet pills more effective? And what about sit-ups? Do they really help us flatten our abs? Before you invest any time or energy into changing your body, get the truth about belly fat. Unfortunately, many diet claims and product advertisements are not supported by clinical evidence. You've probably seen these statements in magazines or you might hear them at the gym. Here is the truth behind these belly fat facts. This statement may be truth in some dieters. A study published in the American Journal of Clinical Nutrition showed that a calorie-controlled diet rich in whole-grain foods helped obese research subjects lose more weight from their middles than those who ate the same diet, but ate refined carbs instead of whole grains. The researchers concluded that whole-grain foods may make it easier for the body to mobilize fat stores. But weight loss happens when you reduce your calorie intake, so your whole grains should be part of a complete low-calorie program to slim down. This statement is fiction. Unfortunately, doing tons of sit-ups or crunches won't actually flatten your belly area if you are overweight. If your abdominal muscles are covered with excess fat, strengthening them won't make your belly area look slimmer. However, if you're at a healthy weight, doing abdominal exercises correctly and consistently will help your stomach area look more toned. But, spot-reducing doesn't eliminate belly fat. This statement is fiction. Some diets might make you feel like you are losing weight only in the belly area. For example, low-carb diets, Atkins, or the South Beach Diet are popular programs with people who want to slim down in their midsection. But when you lose weight, you can't choose where you will get smaller. 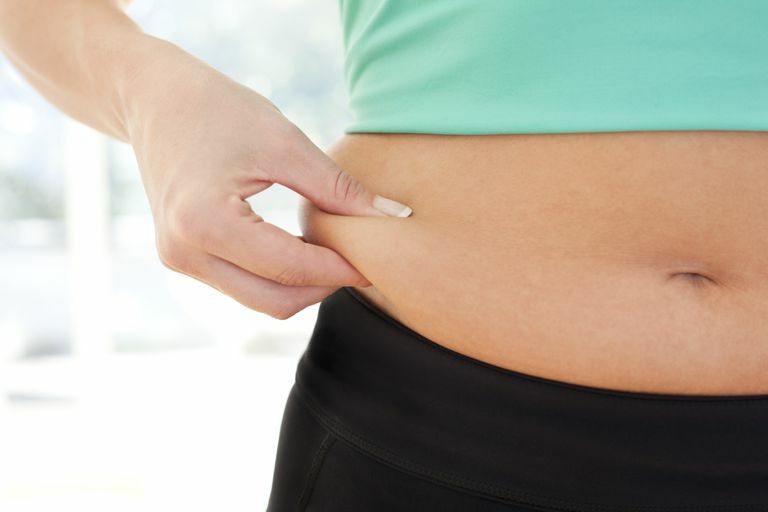 Since many dieters store a large amount of excess fat in the abdominal area, it's the first place a change is noticed. A diet plan can't target any one area of the body where weight loss will occur. This statement is fiction, but there is some truth that hard workouts are good for fat loss. Reducing belly fat doesn't require high-intensity exercise, but some vigorous workouts are very effective for fat-burning. However, you can lose weight simply by putting one foot in front of the other. Researchers at Louisiana State University found that walking for two and a half hours per week was able to shrink belly fat by one inch in just a month in their test subjects. The scientists say that walking even appears to reduce abdominal fat before it's reduced in other areas. Wake Forest University researchers studied 45 obese women and found the ones who walked between 30 and 55 minutes three times a week cut the size of their abdominal fat cells by almost 20 percent. This statement is fact. Belly fat is dangerous because of its location. Belly fat, often called visceral fat, surrounds your organs and increases your risk for heart disease. Research from the National Institutes of Health said that women with a midsection that measured more than 28 inches were twice as likely to die from heart disease than their slim-stomach counterparts. You can find out if your belly fat increases your risk for heart disease and other illnesses by measuring your waist circumference or by calculating your waist-hip ratio. This statement is both fact and fiction. If you reduce fat in your diet, you may also reduce the number of calories you consume each day. If you eat less, you will probably lose weight. But, eating dietary fat in moderation can also help you stick to your weight loss program. The key is the choosing the right kind of fat, like nuts and olives. Remember that there is no magical pill, potion or product that will help you lose weight only from your belly. The best way to reduce belly fat is with traditional methods like a healthy diet and plenty of exercise. Centers for Disease Control. Healthy Weight: Assessing Your.../Waist Circumference. Fahey, Thomas D. et al. Fit and Well for Life. 7th Edition. Columbus, OH: McGraw-Hill Publishing Company, 2007. Katcher, Heather, et al. The Effects of a Whole G rain–Enriched Hypocaloric Diet on Cardiovascular Disease Risk Factors in Men and Women With Metabolic Syndrome. American Journal of Clinical Nutrition, January 2008; vol 87: pp 79-90. National Institutes of Health. Clinical Guidelines on the Identification, Evaluation, and Treatment of Overweight and Obesity in Adults: The Evidence Report. 1998; NIH Publication No. 98-4083. Wake Forest Baptist Medical Center. Exercise Important in Reducing Size of Abdominal Fat Cells, Research Shows. 8 August 2006. Can the Zero Belly Diet Really Help You Lose Belly Fat?